Head back to mediaeval times and defend a castle from attack in Fire Siege Fortress, a 5 reel, 576 ways to win video slot from NetEnt. It comes with the Scandi developer’s usual high spec design as well as plenty of extras including added, colossal and stacked wilds and a bonus round that awards between 9 and 18 free spins. Man the ramparts on all devices from between 20p and £200 per spin. As usual for a NetEnt video slot, the sound and visuals are well done. The reels are set within the outer wall of a castle and are set up in a slightly unusual 4x3x4x3x4 configuration. The lower value A to 10 symbols appear on royal banners. They’re joined by axe, sword and hammer symbols as well as a knight in armour. The most lucrative symbol is the dragon which pays 2, 3 or 6 times your bet if you land 3, 4 or 5 on adjoining reels. There’s also a standard wild. Archer Attack feature – land a wild on the bottom position on reel 2 and an archer springs into life and fires up to 3 arrows onto the reels. The symbols the arrows land on turn wild and a new payout calculation is made. Dragon’s Breath feature – a wild in the bottom position on the middle reel trigger this extra. The wild expands and fills the whole of the reel. Trebuchet Assault feature – the giant catapult whirs into life if you land a wild in the bottom position on reel 4. It adds a giant wild onto the reels. Look out for the crown which is the game’s standard scatter. When 3 of these hit on reels 1, 3 and 5 on the same spin, you’ll trigger the Fire Siege Free Spins feature. The number of free spins awarded is determined by wear the scatters land. Each one at the top of the reel delivers 6 free spins with 3 awarded for each one elsewhere on the reels. The minimum is 9 with a maximum of 18 free spins on offer. Fire Free Spins feature and Tower Coin Win feature – find 2 scatters at the top of reels 1, 3 or 5 and you could still profit even if you miss out on the third. A free spins scatter awards 3 free spins while the coin scatter delivers a bonus payout equal to 5 times your total bet. Like most video slots in the NetEnt catalogue, there’s little cause for complaint about the imagery and sound of Fire Siege Fortress. It looks and sounds excellent. If you like variety from your bonus features, then you should find plenty to like here too as there’s a good range of extras on offer. 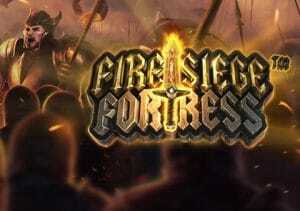 The mediaeval theme remains a popular one and Fire Siege Fortress is a good example of why. Well designed and very playable, it’s certainly worth a spin. You can win up to 3,456 times your bet on every spin/free spin so it has the potential to be lucrative. If you like the medieval theme, NextGen Gaming’s Kingdom’s Edge and WMS’ Black Knight II are worth trying.